Pinterest is not just for Midwestern housewives trading photos of food, clothing and home goods-as a lot of people think it is. This image-oriented site is useful for marketing any kind of business, including a service one. As we move into a more and more image oriented web, these images are a great lead-in to drive traffic to your site and especially directly to a product or service. Many of the ways to generate interest on pinterest are extremely similar to Twitter if you are a user of, and thus familiar with that service, so a lot of this could sound very familiar-all the easier. If you need Twitter help too by the way, I recommend TheArtOfTweeting.com. Something extremely encouraging to understand is, how Pinterest is not like Twitter. Unlike Twitter or Facebook, you do not need a big audience to make a dent on it, you can generate great buzz on your first pin. This is because of the way the site is set up, I had re-pins from people I didn’t even know when I had literally two followers because I pinned quality stuff that was found by either the keywords, or coming up in someone’s feed. 1.) Fill out a good profile, this means a nice photo of yourself, keyword rich, yet natural sounding, and enticing descriptions of you and your business. 2.) Content is key (are you surprised?) Make good boards specific to your industry, and post quality photos of quality products. Don’t forget to sprinkle in some keywords-and you can use hashtags too-but keep the descriptions natural sounding, also add the product URL to the end of the description. You can use the dollar sign symbol ($) to emblazon a banner across the top of the image with a price tag. 3.) Occasionally ask for the share/re-pin, trade re-pins with someone who you follow. 4.) Be active and engaging-pin, like, and comment frequently, especially with top users. Be positive in your activity, and encouraging of other's posts. 5.) Even if you aren’t on Pinterest, you can make inferences about what people think of your product by the pins they do. Not only will you see which of the products from your site that they are pinning to their boards the most, but you see those pins in context. For example, a pin to the board called “I’d give my left arm for this stuff” is a lot better than a pin to a board called “This stuff makes me sad for humanity”! Also you can look at the boards you were pinned-on to get an idea of who your competitors are. 6.) Cultivate an excellent list of people to follow-which in turn will help generate targeted quality users who follow you. 7.) Using the 80/20 rule, try to follow 80% people with similar interests to yourself, and 20% people you have less in common with to broaden your reach. 8.) Don’t rely on the pin boards that Pinterest gives you, make your own ones using your most relevant keywords. 9.) If you are a service business, use infographics to pin with keywords to the appropriate pin board. 10.) Make a list of pinterest boards from other members that are relevant to your own boards that your followers would love to know about. Put them together in a link and share this on all your platforms to drive traffic in a circle to both Pinterest and your brand and back again. 11.) Go to Pinterest's goodies page here and make sure you get the "pin it" buttons to embed on your website. Also consider getting the pin button that downloads to your web browser so you can pin whatever you like yourself at the click-of-a-button. 12.) Enable sharing from pinterest to all of your other platforms. 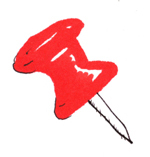 This way with a single Pin you can post the same image to facebook, twitter, etc. Way to kill two birds with one Pin. 13.) Know that you can pin videos too. 14.) Unfollow those who don’t interest you over time, or frankly, who are just bum pinners. 17.) Add your Pinterest profile to your e-mail signature. 18.) If you are pinning someone elses' image, be sure to put the source/credit down. 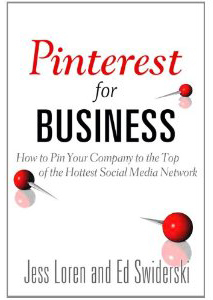 For a more comprehensive look at Pinterest, I recommend the book Pinterest for Business by Jess Loren and Ed Swinderski which I am quoted in. Click to order it at Amazon.com.